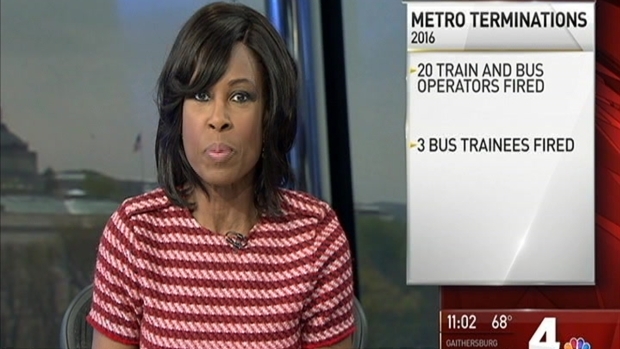 Metro fired 20 train and bus operators last year because they were intoxicated or use their cellphones on the job. Figures provided to News4 show 11 bus operators and three train operators were terminated for violating the alcohol and drug abuse policy in 2016. Five bus operators and one train operator also were fired for violating the agency's cellphone policy. WMATA also terminated three bus trainees for violating the alcohol and drug abuse policy. 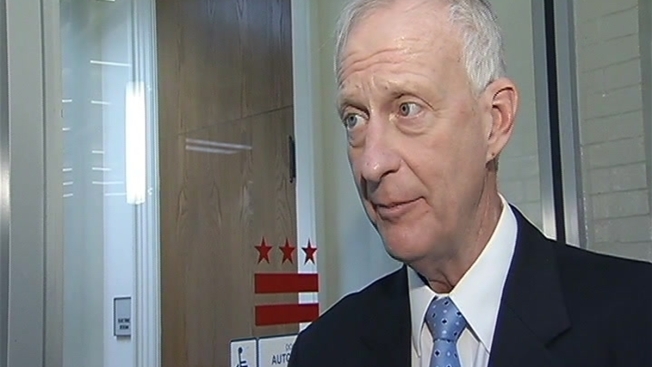 "Unfortunately, with drugs and alcohol, it's a health issue," said Metro General Manager Paul Wiedefeld. "I get it. But I'm not going to put our customers and our fellow employees at risk." Metro fired 20 train and bus operators last year for violating the agency's alcohol and drug abuse policy, as well as the cellphone policy. Metro did not say whether any of these violations resulted in an accident. WMATA could not immediately provide similar statistics for 2015, but it should be noted that Metro's largest union -- which represents train and bus operators -- represents close to 9,200 active employees. Since 2009, Metro has had a zero tolerance policy when it comes to using a cellphone while on the job. However, the transit agency's drug and alcohol abuse policy allows for multiple violations before an employee can be fired. Immediate release from pay status with a return to regular pay status only after satisfactory completion of an Employee Assistance Program (EAP). Employee released from pay status will have 10 working days from notification of disciplinary action to enroll in the EAP. If the employee fails to enroll during that period, the employee will be terminated. 60-month random testing period after reinstatement. Second offense of any detectable level of any intoxicant within a three year period from the first offense, with the exception of alcohol in which a level of .02 or more will be regarded as the minimum detectable level, will result in termination. Detailed briefing on the EAP and the importance of participation and the certainty of discipline for future offenses. 60-month random testing period. Second Offense Within a Three Year Period - Release from pay status with EAP option. Third Offense Within Three Years From the Second Offense - Termination." Amalgamated Transit Union Local 689. Metro's largest union, will often try to reinstate WMATA employees, especially if they feel they have a case. "If any Local 689 member believes that disciplinary action was in violation of the collective bargaining agreement, they are entitled to grieve the action and we will advocate for the appropriate remedy," said David Stephen, a spokesperson for the union. However, sources with direct knowledge of these proceedings say that the union has never been able to reinstate someone for violating the cellphone policy, and if someone repeatedly violates the agency's drug and alcohol abuse policy, there's not much they can do. Previous figures provided to News4 show that four Metrobus operators were fired from the transit agency in 2014 for using a cellphone while operating a bus. In 2012, eight bus operators and one train operator were terminated for violating that policy.